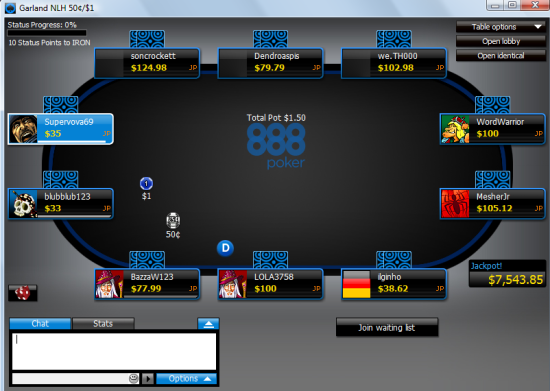 888poker is an online poker site that's part of the publicly traded 888 Holdings Plc. It offers a wide variety of games in formats like sit and gos, multi-table tournaments, and ring games. There are also No Limit, Limit, and Pot Limit games and the site is known as being one of the softest on the Net. For those looking to take advantage of a 100% first deposit bonus of up to $400 and a high-trafficked poker scene, then 888 could be the ideal place to make your next deposit. Being one of the highest trafficked poker sites on the Net, 888poker will give new depositors plenty of action 24 hours per day at a variety of games and buy-in levels. 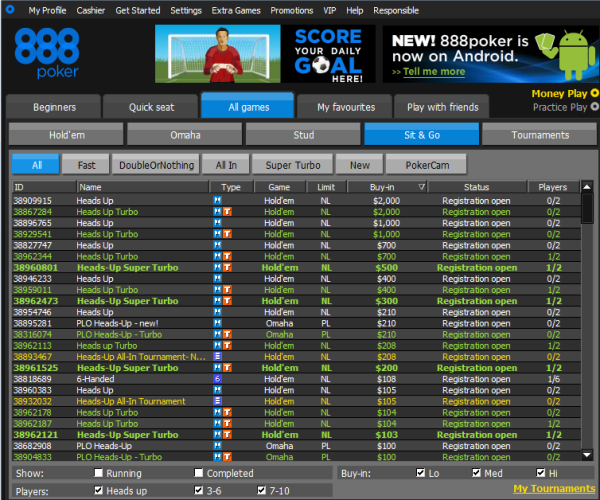 Plus, 888 has innovative webcam tables that do not exist on other online poker sites. There is also a "Quick Seat" tab that gives players the option to select game type, table type, and stakes in order to be taken directly to a table that fits their filter parameters. Plus, there is a "My Favorites" tab for picking the games you want to enter and having them displayed conveniently within this area. The most popular cash games on 888Poker are generally the $1/$2 No Limit Hold'em Six-Max tables, which have a maximum initial buy-in of $200 and a minimum of $40. As for tournaments, 888's two flagship events take place on Sunday. The Sunday Challenge is a $90 tournament with one rebuy allowed that typically pays over $20,000 for first place. The $120,000 Mega Deep is a $215 buy-in event that pays over $30,000 for first place. The 888 VIP tier-based system begins at the Blue level with 2% cash back and players can obtain Iron status by earning 10 Status Points on a monthly basis. 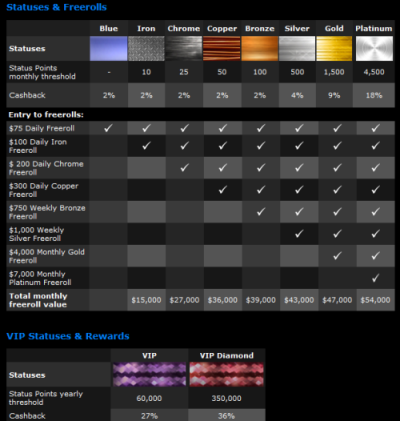 As you earn more points, your VIP status will correspondingly increase to Chrome, Copper, Bronze, Silver, Gold, and Platinum. All of these monthly tiers have a different range of benefits along with their own cash back percentages and monthly freerolls. All in all, 888Poker.com has a multitude of attractive incentives to convince new players to sign up and begin competing. Many in the industry feel that 888 Poker has just the right blend of games, player fields, and soft competition to grow significantly in the coming years. Currently, U.S. players are not allowed on 888.